When a Pope names himself after the most famous animal-lover of all time, and then chooses to write his first encyclical on ecology, expectations can become…um…rather high. Laudato Si’ did say several wonderful things about non-human animals. And especially given what it says about our relationship to creation more generally–along with its level of authority and popular attention–I don’t think its a stretch to say that could become the most important text written about animal concern since Peter Singer’s Animal Liberation. None of these strong claims are warranted by what’s found in the text. While the encyclical did say several hopeful things about animals, there were also several missed opportunities. Let me briefly highlight three examples of each. 2. Explicit skepticism of big agriculture. Given the amount of suffering that billions of animals undergo in huge factory farms, it was great that the Pope lifted up “small-scale food production systems which feed the greater part of the world’s peoples, using a modest amount of land and producing less waste.” (#129) These smaller farms are much better-able to care for their animals as the kinds of creatures they are. 2. No explicit reflection on factory farming. This was a huge missed opportunity, not only because of intrinsic value of the creatures who suffer so terribly in these buildings, but because it is perhaps the best example the Pope’s could have invoked to explain his central idea: integral ecology. The intense and horrific harm done to animals is one set of concerns, but the human/non-human interrelatedness of harms is overwhelming: too much animal fat in our blood causes heart disease and cancer. All kinds of chemicals and drugs necessary to maximize protein units per square foot in factory farms are getting transferred to human bodies. In particular, we are creating dangerous superbugs via huge amounts of antibiotics with which we douse these creatures. And, of course, factory farms are probably the most serious source of carbon emissions. Any aspect of reality? Really? I was being pushed on Facebook after the encyclical’s release to defend the value of the Ebola virus. And what about the skin cells I kill when I scratch an itch on my arm? Is squatting a mosquito the moral equivalent of growing a pig in torturous conditions for profit? These kinds of questions require careful attention to complex and controversial issues, so perhaps they go beyond the scope of this particular (and already long) encyclical. But moral theologians are beginning to give these issues the attention they deserve, and grounded in several of Laudato Si‘s foundational ideas about creation, technology, consumerism, and asceticism there are now wonderful (and urgent) opportunities to do even more. PreviousAre the faithful drifting, being neglected or struggling? It is Moral to Watch American Football? I realize the Pope can not get in to detailed specifics on every issue, but this is one issue where a single specific suggestion would have probably been more useful than a more general theological philosophy. Although the Pope has a huge number of admirers, most of them are not intellectuals, and it seems reasonable to question the degree to which the Pope’s audience can translate sophisticated theological language in to practical direct action. The single most efficient and effective thing all of us can probably do in our daily lives for both animals and the environment is become vegetarians. This is something almost everyone can understand and act on right now. 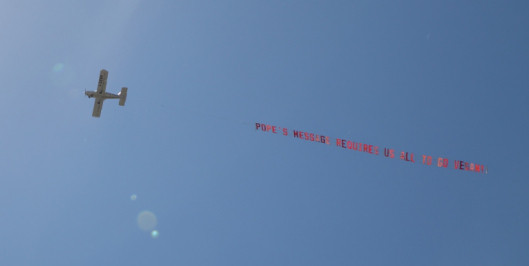 I realize that having the Pope push this suggestion would have generated some controversy, but that’s not necessarily bad as it would bring more attention to the Pope’s message. In today’s world, a single simple somewhat controversial suggestion is much more likely to earn attention than more sophisticated and nuanced arguments. Simple and specific is good, so long as the suggestion is wise.